TOPEKA, Kan. (AP) — A water park company co-owner accused of rushing the world's tallest waterslide into service and a designer accused of shoddy planning have been charged in the decapitation of a 10-year-old boy on the ride in 2016. With the latest charges unsealed Tuesday, three men connected with Texas-based Schlitterbahn Waterparks and Resorts and its park in Kansas City, Kansas, have been indicted by a Kansas grand jury, along with the park and the construction company that built the ride. Caleb Schwab died on the 17-story ride when the raft he was riding went airborne and hit an overhead loop. The Kansas attorney general's office said Schlitterbahn co-owner Jeffrey Henry, 62, and designer John Schooley were charged with reckless second-degree murder, along with Henry & Sons Construction Co., which is described as the private construction company of Schlitterbahn. Second-degree murder carries a sentence of 9 years to 41 years in prison. They also were charged with 17 other felonies, including aggravated battery and aggravated endangerment of a child counts tied to injuries other riders sustained on the giant slide, called Verrückt, which is German for "insane." The indictment accuses Henry of making a "spur of the moment" decision to build the ride, and that he and Schooley lacked technical or engineering expertise in amusement park rides. Henry was ordered held in a Texas jail without bond Tuesday, pending extradition to Kansas. The attorney general's office said Schooley is not in custody. Schooley didn't have a listed phone number and no one answered the phone at Henry & Sons Construction Co. Eric B Terry, who represented the company in an earlier unrelated case, didn't immediately return a phone or email message. The same grand jury last week indicted the Kansas City park and Tyler Austin Miles, its former operations manager, on 20 felony charges. The charges include a single count of involuntary manslaughter in Caleb's death. Miles has been released on $50,000 bond, according to one of his attorneys, Tricia Bath. Schlitterbahn spokeswoman Winter Prosapio said in a statement Tuesday that the latest indictment "is filled with information that we fully dispute." The statement said Henry had designed waterpark rides "the world over" and that "nearly every waterpark that exists today has an attraction or feature based on his designs or ideas." "The incident that happened that day was a terrible and tragic accident," the statement said. "We mourn the loss of this child and are devastated for his family. We know that Tyler, Jeff, and John are innocent and that we run a safe operation - our 40 years of entertaining millions of people speaks to that." 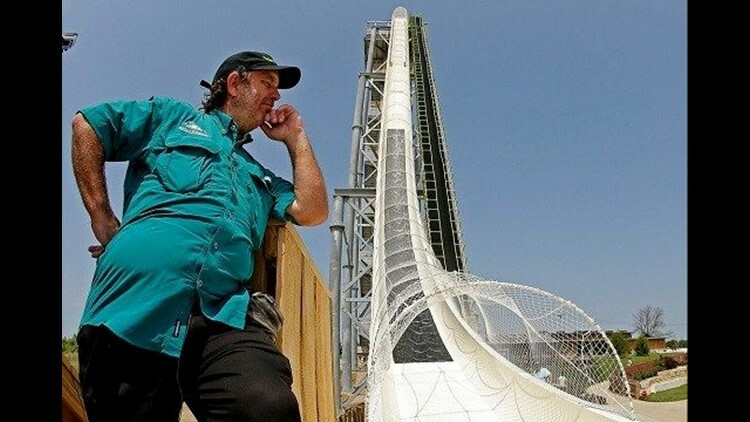 According to the indictments, Henry decided in 2012 to build the world's tallest water slide to impress the producers of a Travel Channel show. Henry's desire to "rush the project" and a lack of expertise caused the company to "skip fundamental steps in the design process." The indictment said, "not a single engineer was directly involved in Verrückt's dynamic engineering or slide path design." The indictment said that in 2014, when there were news reports emerging about airborne rafts, a company representative "discredited" them and Henry and his designer began "secretly testing at night to avoid scrutiny." Caleb, the son of Kansas Republican state Rep. Scott Schwab, was decapitated after the raft on which he was riding went airborne on a day when admission was free for state legislators and their families. The family reached settlements of nearly $20 million with Schlitterbahn and various companies associated with the design and construction of the waterslide. The two women who rode on the same raft with Caleb suffered serious injuries and settled claims with Schlitterbahn for an undisclosed amount. "Clearly the issues with Schlitterbahn go far beyond Caleb's incident, and we know the attorney general will take appropriate steps in the interest of public safety," the family said in a statement released Monday through their attorneys. The indictment said Schooley was responsible for doing "the math" that went into the slide's design and signed an operations manual claiming the ride met all American Society for Testing and Materials standards. But the indictment lists a dozen instances in which the design violated those standards and says investigators could find no evidence that so-called dynamic engineering calculations were made to determine the physics a passenger would experience. The indictment said Schooley lacked the technical expertise to properly design a complex amusement ride such as Verrückt. The indictment said Schooley admitted, "If we actually knew how to do this, and it could be done that easily, it wouldn't be that spectacular." Prosapio said Schlitterbahn does not expect any changes to the Kansas City park's season, which is set to open May 25 and runs through Labor Day. The Verrückt slide has been closed since Caleb died.